A Boston Food Diary: Ben & Jerry's Free Ice Cream Coming to Boston! With temperatures headed into the 90's this weekend, I thought I might as well continue on the ice cream trend with another announcement of FREE ICE CREAM coming to Boston! 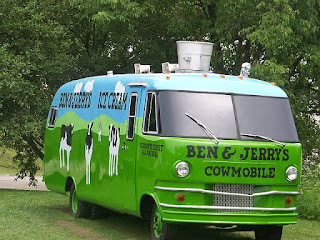 July 28 through August 25, that's right-almost a full month, a Ben & Jerry's Ice Cream truck will be rolling through the neighborhoods of Boston offering free scoops of two of their newest flavors: Milk and Cookies and Boston Cream Pie. If you haven't had a chance to try these flavors out, they are both pretty incredible. Milk and Cookies combines the idea of chocolate sandwich cookies (I have no idea what the legal implications of using the actual name is), chocolate chocolate chip cookies and chocolate chip cookies all into a creamy vanilla base. This sweet treat tastes like going back home again and dunking cookies into milk in mom's kitchen after school. This is also one of Ben & Jerry's Fair Trade flavors. This means that it incorporates Fair Trade certified ingredients (ingredients that are created with the idea in mind of helping out the farming community), here cocoa & vanilla, into the mix. So really this flavor is helping the world- and when you're helping the world calories don't count right? The second flavor, Boston Cream Pie, is a delicious nod to Boston and our most famous dessert! This one combines pieces of vanilla cake, chocolate flakes, and pastry cream all into an ice cream base that they actually call Boston Cream Pie. So with this one, you can show your pride of city, while cooling down from the excessive heat! Perfect! Ben & Jerry's is making their almost month long initiative even more fun than just giving out free ice cream (if that's possible) and are asking us, the people of Boston, to tell them where to park the truck next! They will be taking suggestions through their Facebook page, and their Twitter account (@BenJerrysTruck)- so everyone can get in the fun! More information can be found at www.benjerry.com or just start following them on Twitter- you know you want to! In just a few short weeks, the truck will arrive, ready to pass out tons of sweet treats- where will you want them to go?? this is awesome. I hope they visit the North End. I tried the Boston Cream Pie - it wasn't my favorite of thie flavors. Would love to try thr Milk and Cookies!